Is there a biofuel alternative on the way? 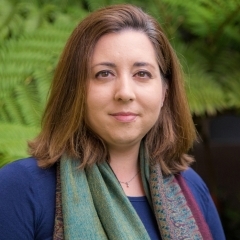 Michelle O’Malley, assistant professor of chemical engineering at the University of California Santa Barbara, describes looking inside the guts of animals for a potential fuel of the future. The O’Malley Lab works at the interface of engineering and biology to engineer microbes and consortia with novel functions. We are especially interested in deciphering how “unwieldy” microbes in the environment perform extraordinary tasks – many of these microbes have no available genomic sequence and are exceptionally difficult to manipulate. We seek a better understanding of how proteins are synthesized by cells, and how their three-dimensional structure informs their function would enhance our ability to engineer proteins (and cellular expression platforms) for diverse biomedical and biotechnology applications. To address these issues, our approach combines classical cell biology tools with cutting-edge technologies (genome sequencing, RNAseq, cellular reprogramming) that are rooted in the core biological sciences to interrogate and engineer molecular mechanisms that underlie protein production in eukaryotic cells. In addition, we rely on biophysical methods to elucidate protein-protein contacts, with the aim of controlling these interactions both in vivo and in vitro. Systems of interest to us have broad applicability to bioenergy and sustainability, as well as to drug development and detection. As we move away from greenhouse gas-generating fossil fuels, finding alternative sources of energy is absolutely necessary. Fortunately, biofuels – & even commodity chemicals – can be derived from plants. Today much of these materials are taken from the starchy and sugary parts of plants, which is why wheat, corn and sugar cane are among the most popular sources of biofuel. But, humans and livestock need those foods also. And as the demand for both food and energy grows, the competition for crops and land intensifies as well. Farmers and growers have to make choices between growing crops for food, and crops for fuel. In my work, I investigate the potential for using anaerobic microbes that live in the guts of large herbivores like cows and sheep, whose digestive tracts have evolved to break down not just the starchy, leafy parts of plants, but also the tough, fibrous parts like stems and roots, for energy & chemical production. These anaerobes, which live in the oxygen-free environments of an herbivore’s gut, secrete enzymes that can break down and convert the tough structural parts of plant cells called cellulose into sugars, which the animal then uses for energy. My colleagues and I are working on finding and characterizing these primitive and little known microbes, which include unusual fungi, as well as bacteria and single-celled organisms. And, we’re studying how they work to break down and convert plants to sugars, processes that we also may be able to use to synthesize new chemicals and pharmaceuticals that were previously sourced from non-renewable materials. If we can utilize those mechanisms, we can access the energy locked in the most abundant polymer on earth. We can use most, if not all parts of the plant, and we can use a variety of plants. Maybe soon your grass clippings and green waste could become your next tank of fuel.